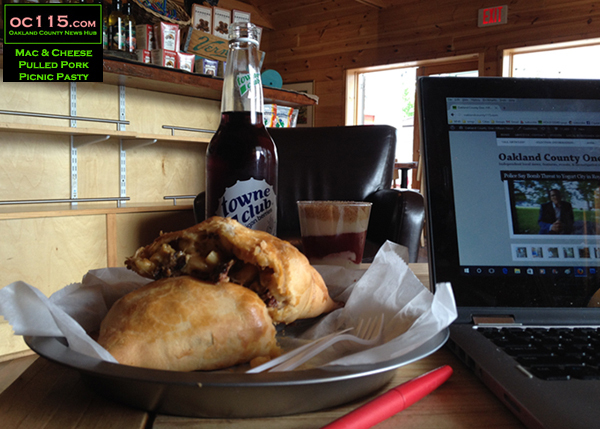 Ferndale, MI – Let’s say you need someplace to work that is cozy with good internet, often has other people working, and has a nice selection of comfort food. One such place is M-Brew in Downtown Ferndale (177 Vester Street). 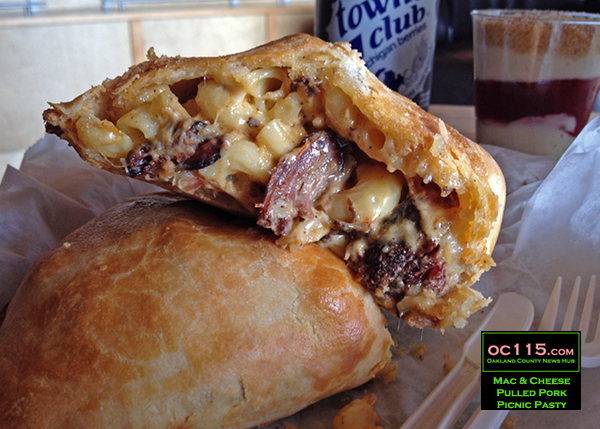 That’s what I needed the other day, and this is what I got: a Bruce Crossing Pasties Mac & Cheese Pulled Pork Picnic Pasty. Yup, that is creamy macaroni and cheese mingled with bite-sized pieces of pulled pork wrapped in buttery dough that is soft on the inside with a crispy layer on top. I also splurged on a parfait cup and a Michigan Berries flavored Town Club soda pop. M-Brew specializes in Michigan foods and beer (and a whole rainbow of Town Club soda pop). They are best known for their gluttonously delicious pizza made with Pinconning cheese and other local ingredients. For those who like old school pinball games, the lower level of M-Brew is full of them. The main level is a great work spot, or a place to bring friends and family. The decor has an up north feel, with lots of wood and Michigan-themed products displayed. And before long it will be time to enjoy the crackle of the fire place in the corner. Explore more at www.mbrewonline.com. They are a sponsor of oc115, but I would still eat this even if they weren’t.